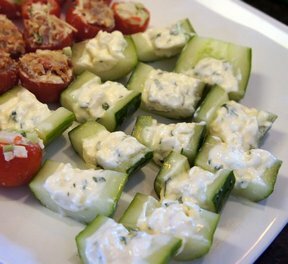 A refreshingly light appetizer for any occasion. Cut cucumbers lengthwise. With a spoon, scoop out seeds to form a hollow center. Combine carrots, green peppers, banana peppers, tomato relish, cream cheese and tobasco sauce. 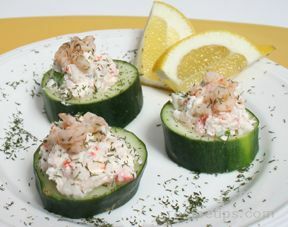 Mix, scoop and spread into the center of the cucumbers. Sprinkle with extra carrots and peppers. 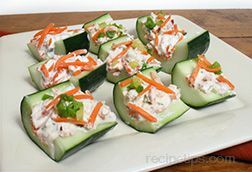 Cut each cucumber halves into 4 pieces if desired. Chill in refrigerator or serve immediately.